Beat cream on high speed in bowl of an electric mixer until soft peaks form. Beat in sugar and vanilla. To Assemble Cake: Carefully cut each cake layer in half using a sharp serrated knife. Place 1 layer on serving platter. Brush with rum syrup. Spread with 1/3 of ricotta filling. Repeat procedure with remaining layers ending with a cake layer on top. No sooner than 6 hours before serving, frost sides and top of cake with all but 1 cup of frosting. Decorate with remaining frosting, chopped chocolate and fresh berries. Refrigerate until serving time. 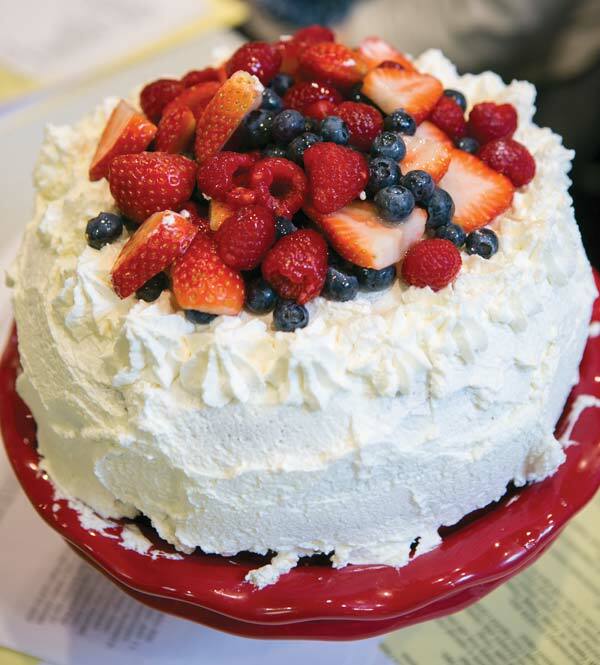 A Sicilian Cassata Cake was one of the four gluten-free recipes made in chef Tina Bare’s cooking class at Zest!.